Children are one of life's greatest gifts, but little ones come with some cargo. If your idea of home design doesn't include a mountain of toys and a scattering of stuffed animals in every room, consider converting space into a dedicated kids' playroom. Owners of WoodBuilt Homes, Inc., Linda and Steve Quigley did just that. The Quigleys, who have their grandchildren over frequently, transformed their small guestroom into a fun, functional kids' room, complete with a playhouse. In designing the room, the Quigleys focused on utilizing space to the fullest extent. The room had a 5.5-foot by 10-foot walk-in closet that the Quigleys thought would make a perfect spot for a whimsical playhouse. For storage, they added two bi-fold closets into another wall and used bunk beds to free up floor space. Linda and Steve Quigley, WoodBuilt Homes, Inc. They transformed the walk-in closet by vaulting the ceiling, adding an upper floor at about four-and-a-half feet, and building stairs between the two floors. "It kind of evolved," says Linda. "We talked about doing more of a loft idea, but once it was framed in, I didn't think the (new space in the closet) was big enough to accommodate the original plans." The entry is a child-sized cutout, with a second mouse hole-shaped cutout on the second level that leads to a long green slide. The Quigleys also added a safe and kid-friendly touch to the playhouse: low-voltage halogen shower lights that won't burn curious little fingers. The remodel seems to be a hit with its intended audience. One 13-month-old grandchild has discovered the light switch and loves to turn it on and off, says Linda with a laugh, and the 3-year-old loves to climb the stairs and slide down. 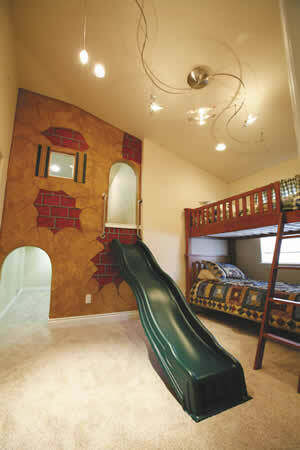 Best of all, Linda and Steve Quigley can enjoy newly freed up space in their own "playhouse" — the family room.